Pan-Fried Porkchops – this one from the Pioneer Woman. Can’t wait to try it! Mashed Potatoes – Make your favorite recipe, or pick up the refrigerated kind (just nothing boxed). Roasted Cauliflower – this one from Food Network is so good and easy! Even if you think you don’t like cauliflower I think you’ll like this. Sliced Tomatoes – They’re in season right now and add great color to your plate. Mexican Meatball Street Tacos – Don’t these just sound good? Looking forward to Tuesday. Here’s the recipe. Mexican Three Bean Salad – This is great and you pretty much just dump some cans of beans and a few other things together, then mix. Here’s the recipe. Corn – Take some frozen and saute it in some butter until lightly browned. If you really want to jazz it up add a little garlic and chopped red pepper. 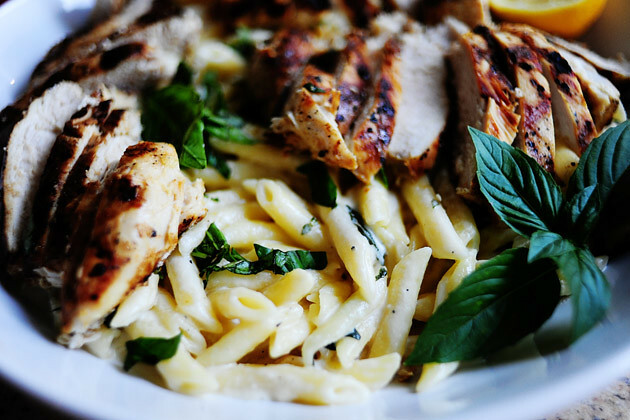 Grilled Chicken with Lemon Basil Pasta – Another tasty dish from the Pioneer Woman. Bread – Think you can’t make homemade bread? Thing again! Baguettes in 30 minutes. Trust me. These guys are easy and so tasty. You will love the smell in your house. Here’s the recipe with pictures and video. Pizza Night – make it at home and you can control the ingredients. There are some really easy crust recipes like this one, or you can buy the dough ready made (not the canned stuff). The trick for pizza is to pre-bake the crust until just golden, add just enough sauce (but not covered in thick sauce), cover in cheese (but still leaving room that you can see through the cheese to the sauce), then the toppings. If you put a lot of veggies on it, consider baking them first to remove some moisture so you don’t get soggy pizza. This entry was posted in Main, Menus and tagged homemade pizza, meatballs, Menu, porkchops. Bookmark the permalink. ← BBQ Chicken Pizza – Homemade Quick! Thanks for the link to my baguette recipe!